You may recognise the above picture known as the ‘bridge diagram’ (although my artistic skills have made this version particularly unique). This simple diagram is often used among the evangelicals in order to communicate the gospel. Ideal for those situations where your friend or even a stranger asks you how the separation between them and God can be overcome (of course it can happen!). These 3 or 4 simple illustrations show the separation between us and God, the cross that bridges the gap, and the result: that you can hold hands with Jesus. Zoomtards obsession with Bill Hybels has lead me to think about the ‘bridge diagram’, and as tempted as i am to mock it without mercy i am trying to consider the good stuff about it. Aside from the fact that it is probably rarely used in real life, I think the picture of the gospel that the bridge diagram presents is distorted. It is distorted mainly because it is incomplete. But that is exactly the problem with trying to boil the gospel down. we try to sum it up in a diagram, or 3 sentences or an anagram or a multi-coloured bracelet… and although the motive behind this is to communicate the truth of the gospel clearly which i love, i don’t think this does it well. Part of the problem is that in our efforts to communicate the gospel in these ways we are only communicating part of it, that in itself is not a problem, but it is a problem if we are letting people believe that what we are telling them is the whole gospel. This is my frustration with many of these tools. I do however recognise that they can be helpful tools, they provide memorable pictures in our minds that are useful when we are in conversations about the gospel, and even if we dont whip out the old napkin and pen, they can help anchor our thoughts and words. I think i would like the bridge diagram more if God walked over the bridge to us rather than us to Him, i think that is a truer picture of the gospel. Mostly i dislike these methods because they feel conceptual and a little clinical. To me the bridge diagram feels like a step by step programme to something good, but such a diagram is useless unless i know something of the beauty and love of God and his heart for us. Why else would i care to ‘walk across the bridge’ to God. I know that people who are fans of these diagrams see them as only tools to be used inside the context of sincere and loving friendships though which really helps provide good context. I do not doubt that God has used these tools to bring many people to Himself. I also do not doubt that these tools communicate truth clearly. But personally I don’t feel that they capture the sense of story that exists, nor do i feel that they capture the heart of God for us, the way he relentlessly loves and pursues us. Mostly they don’t communicate that our salvation is only part of God’s big plan of cosmic reconciliation (which lets face it is way cooler). When someone comes up with a diagram that illustrates the life that is truly life i might listen. from she who is preparing her apologies in advance of offending many that she loves. 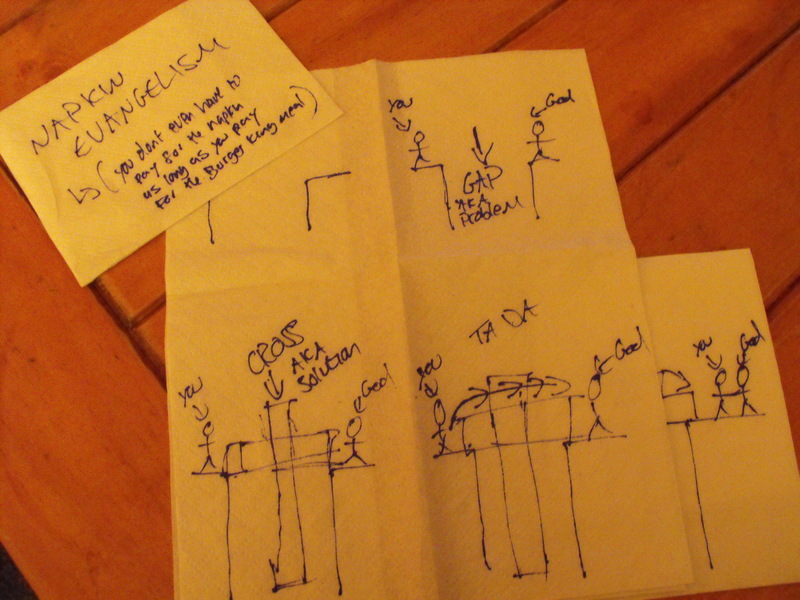 ps if napkin evangelism was advertised in the US it would take on a whole new meaning right?! do we still grow in heaven? “I wonder what hell is like? Not what it is like, but what would I be like if i were there? I wonder if Lewis is right, that i would become an eternal horror that i couldn’t imagine in my worst nightmare? Despite what hell is or isnt like, this thought got me thinking about the old theme of absences. Part of what makes hell hell is not just the reality of how things are but the absence of what we long for and the inability to reach it. The potential to live. The potential to love. Simply the absence of potential. The idea that i could be frozen as i am today and never grow any more in heart is actually one of the most torturous thoughts i have ever had. THIS in turn made me wonder about heaven. I know there I’ll be sinless but will i be static or will there always be room for me to grow in the expanse of my heart for others? Will there always be potential?